WESTWOOD, Calif. -- Flossy Liebman is a collector of clocks, but she’s losing time. 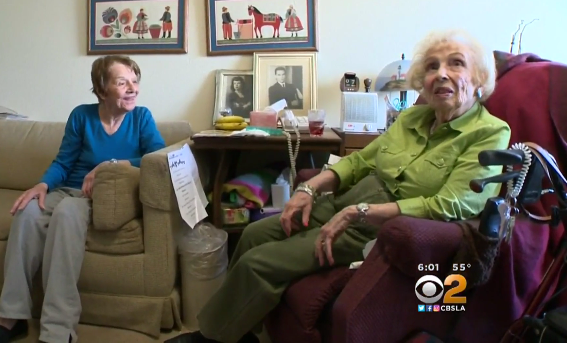 The 95-year-old says she and the roughly 200 others at Vintage Westwood Horizons senior living center are being evicted, CBS Los Angeles reported. Many of the residents are in their 90s. Notices were posted on the residents’ doors last week, saying the seniors have until the end of March to move -- and most don’t know where to go. “I mean everybody’s panicked,” Liebman said. Some of the residents have financial limitations. Loneliness is also a factor. At the senior center, they say they don’t feel alone. The evictions are rooted in a change of management. Watermark Retirement Communities, based in Tucson, Arizona, now manages Vintage Westwood Horizons, and it’s making renovations that could take up to two years to complete. When renovations are done, rental rates will change. “We recognize the fact that this news has a great impact on residents, families and associates and pledge to support them throughout the process,” Watermark said. L.A. City Councilmember Paul Koretz is planning to fight it. “The law may allow Watermark to do this... but it’s still the wrong thing to do and I can’t support it,” Koretz said in a statement. Koretz is planning to stop or delay the evictions.